Hmm. . .I'm starting to see a disturbing trend in my weekends - I wrote last week about accomplishing one thing on Sunday (a mini kitchen cabinet re-org) in between watching a whole lot of movies. This weekend I managed to fit in a full 20 episode season of Veronica Mars. Yikes. In my defense, it was so incredibly hot and humid outside that my one hour of errands nearly caused me to sweat to death. Back to the air conditioned apartment, please! Instead, let's focus on how I spent my Saturday - finally getting around to making some cards! Ahh, productivity, I missed you. A few months ago, my aunt sent me a pack of Jim Holtz Idea-ology "Adage Tickets." 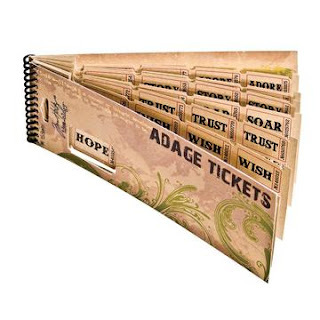 Looking like raffle tickets, but featuring words like, "love," "giggle" and "wish," the creative possibilities to use these for scrapbook pages and cards are endless. I thought I'd try to begin a stockpile of cards to keep on hand rather than needing to make a one-off every time a birthday or other occasion comes up. This is why I've been finding myself at Walgreens more often lately in the card aisle. . .although, I can't help but love the Hoops and Yoyo audio cards. Love 'em! First off, I took inspiration from a $1 rubber stamp I found at Michael's that simply says "Bon Voyage." I had picked up a packet of travel-related photos and embellishments and thought the moving train fit well with words like "live," "play" and "soar" for a vintage travel look. I was trying to find a pack of vellum envelopes that I could put tickets in and glue to the front of a card, but the only one I found that day at Michael's was part of a packet (hence, the reason I picked up the travel images and embellishments and therefore ended up with my train image!). Keeping the following cards blank inside allow me to use them for different occasions - this one could be for a new baby, engagement, anniversary or just because! Similar to the above card, I found another "pocket" to tuck the tickets into and embellished with some 3-D heart stickers. A sticky-backed frame that came with a sticker set fit perfectly over the top of one of the cards. Of course, this makes it a bit thick for the envelope so I think this one might need to be a hand delivery! Finally, I had to think of a cute way to use single tickets as I was finding a lot of one-offs after tearing off sets of three for most of the cards. As you can probably tell, I like simpler cards so all I added to this one was some paper cut with craft scissors and my gift stamp. And so, a mini-stock pile has been created. I need to set aside some more time in upcoming evenings to keep these rolling in - it is also a good reminder to embrace snail mail correspondence. Nowadays, with e-mail and e-cards, bills and junk mail seem to be all that fill the mailbox day to day!